I will admit, that even though I was an English major, I have never read a Jane Austen book (American Lit and creative writing minors!). I have, however, watched the movie, Pride and Prejudice, a couple different versions even. I was familiar enough with the characters and references that I don’t think I missed a thing, with this modern retelling of that story. I will say though, that even if you haven’t read, or watched(!) Pride and Prejudice, I think you will enjoy Curtis Sittenfelds quick wit, hilarious characterizations, and the ability to string words together in a way that feels a little formal while still is relevant to how we communicate today. The following synopsis has been taken from Amazon.com. It’s hard for me to read a novel about a dysfunctional family, which the Bennet family certainly is, and not think about my own. Unlike Mrs. Bennet, my mother did not try to marry off my sister and I, though, she did despair that we weren’t ladylike enough, and at one point thought I was a lesbian. No, I am not. I was just a private person who didn’t like to share every detail of my life with my mother. However, there were some similarities. Liz, who is the main protagonist in this story, reminded me a bit of myself. She was very straightforward, spoke what she thought, and was hilariously funny. I do think I’m hilariously funny, but I’m not sure my friends and family would agree. They would definitely agree with the straightforward speak what I think part! Liz had a take charge attitude, and really, the only part of her life that wasn’t going well was her slightly nutty family and her love life. I can relate to both of those. Nutty family, and the craziness of being single in a big city, although my singleness was awhile ago. I imagined my sister was Jane, who dated Chip the Bachelor-like stud in the titled show Eligible. That thought actually makes me laugh out loud! Even though she does not and has not dated the hunk from a reality show, my sister and Jane are both the calm sounding boards of our families. The siblings who aren’t afraid of taking a big risk to get what they want. In Jane’s case, insemination, my sister’s risk was quitting her job and moving halfway across the country to start anew. Both things take guts. Jane and Liz’s relationship to each other also reminds me a bit of my sister and I. We are each other’s confidante and remain standing against some of the crazy shenanigans of our own family. My last pairing up of my family vs the Bennets would be Mr. Bennet and my brother. They both have the same dry wit, and one liners that level a room or are thrown out there to start trouble. I loved Mr. Bennet! He was so calm in his poor health and insolvency. Also so appreciative of Liz’s help and loved her very much. It would be remiss of me to not bring up Darcy. In Liz’s eyes, he did seem to be a bit of a bore. BUT, as we discovered, Liz’s eyesight was not that great. You will understand what I mean when you read the book. Darcy, in this book as well as the original, is the stalwart, loyal, steady, hunky, hero. 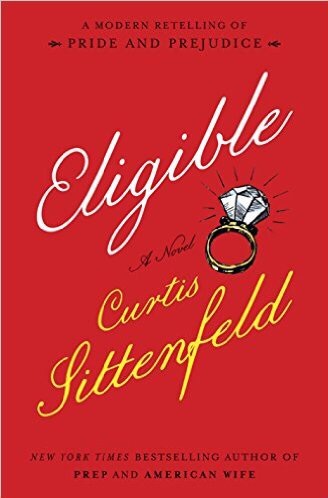 Curtis Sittenfeld did not stray from that portrayal at all, and I was not disappointed in the least. I spoke to my sister on the phone today and recommended she read this book. She, unlike myself, has probably read Jane Austen, but if not, I know she’s seen the movie. However, I recommended it because it’s a wonderful story about a family, with quirks and heart. And, oh yeah, there are a couple of wonderful love stories thrown in there as well! I received a copy of this book from the publisher Random House through NetGalley for my honest review. #RT16 Convention #books and swag #giveaway! I thought it was great! It was funny and sweet. Now you have me curious, so I’ll have to pick up a copy. I’m in that weird “in-between books” stage where I can’t decide what to read next (too many options! ), but this review has firmly pushed me towards picking up Eligible. Plus there can never be too many Darcy’s in ones life. Also, I loved your sentence on humor; I also think I’m incredibly funny, but I’m never sure my friends are laughing because they agree with me or because they feel bad for my delusions. I’m sure you and I are just as funny as we think we are! Enjoy the book!